Add the speed and storage capabilities of 40 Gb/s Thunderbolt 3 and RAID to your Windows or Mac system using the mSpeed 8 64TB 8-Bay Thunderbolt 3 RAID Array from mLogic. Designed for 4K, 8K, and VR workflows, the mSpeed 8 is a powerful storage solution for digital content creators and post-production professionals. It is equipped with dual Thunderbolt 3 ports that offer bi-directional data transfer speeds of up to 40 Gb/s. While one Thunderbolt 3 port is used to interface with your compatible system, the other can be used for daisy chaining up to five additional Thunderbolt devices, including dual 4K displays or a single 5K display. Additionally, three JBOD units can be added using a SAS expander port. Powered by a 1.2 GHz RAID-on-Chip Dual-Core processor and 2GB of DDR3 RAM, the mSpeed 8 has eight drive bays that support 3.5"/2.5" SAS-2 or SATA III 6 Gb/s hard drives and SSDs (8 x 8TB enterprise hard drives preinstalled). Users will be able to configure this RAID with just hard drives, just SSDs, or mix and match the two for data transfer rates up to 2600 MB/s. The eight drive bays can be configured in a variety of hardware-controlled RAID modes, including RAID 0, 1, 5, 6, and 10, each of which offers performance, data redundancy, or a combination of both. For those who do not require a RAID, JBOD mode is also available. mLogic's mSpeed 8 8-Bay Thunderbolt 3 RAID Array is cooled using a single fan and is powered by an internal 110/220 VAC power supply. Included is a 3.3' Thunderbolt 3 cable, eight removable disk modules with hardware, and an AC power cord. Protection is provided by a limited 3-year warranty. The mSpeed 8 features eight removable drive bays that support either 2.5"/3.5" SAS-II or SATA III 6 Gb/s hard drives or SSDs. 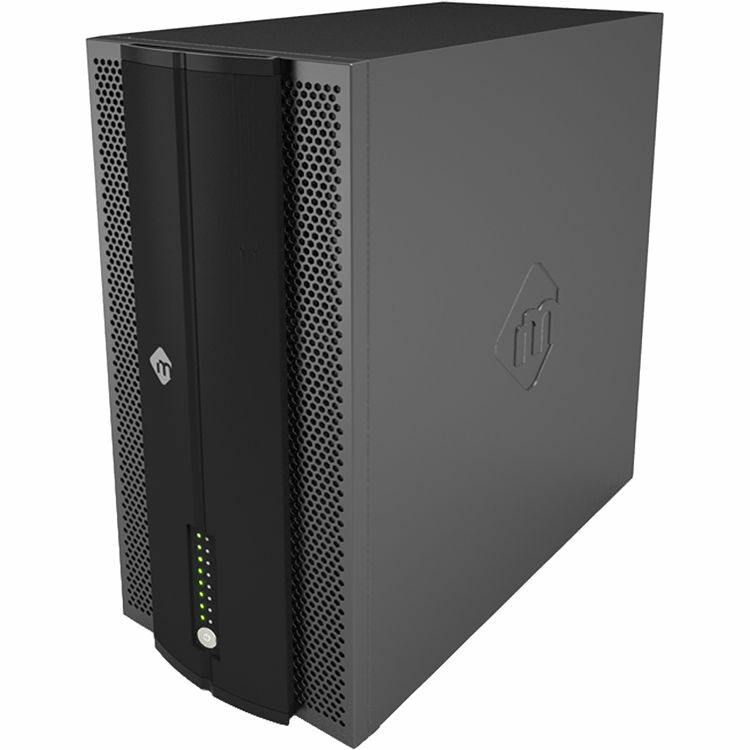 The enclosure comes with all eight drive bays preloaded with 8TB enterprise hard drives, but can also be used with your own hard drives, SSDs, or a combination of both. When SSDs are installed, it is possible to achieve data transfer rates of up to 2600 MB/s. The mSpeed 8 supports a variety of hardware-controlled RAID modes, including RAID 0, 1, 5, 6, 10, and JBOD. The dedicated 1.2 GHz RAID-on-Chip Dual-Core processor with 2GB of DDR3 RAM offloads RAID processing from the host system, helping to ensure stable and high-performance data transfers. Setting up a RAID set is user-friendly with the included mLogic RAID Manager. The mSpeed 8 is equipped with a SAS expander port and two 40 Gb/s Thunderbolt 3 ports that enable daisy chaining of up to six Thunderbolt devices. The unit also supports dual 4K monitors or a single 5K monitor. The mSpeed 8 is bundled with a full version of KYNO software. KYNO is an all-in-one media management app for macOS & Windows. Ingest-free media management, screening, and transcoding that adjusts to your workflow.